Circa 1896. 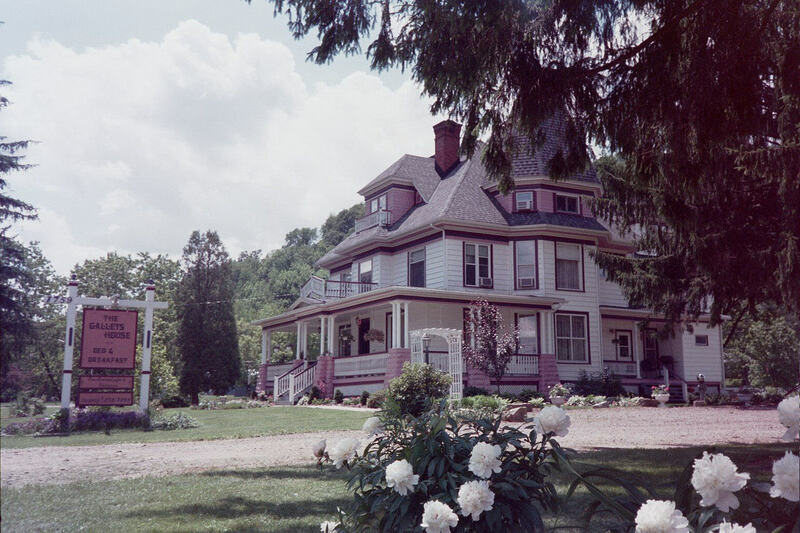 Built by the innkeeper's great uncle Joseph Gallets, who was an oil producer, lumberman and farmer, this historic Victorian home features a third-floor museum with original family photos and heirlooms to browse through. Relax by the fireplaces in the parlor and common room. Enjoy refreshments on the 100-foot porch. Elegant air-conditioned guest bedrooms feature private baths and robes. 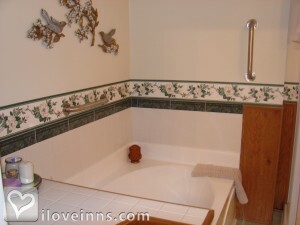 Two rooms boast whirlpool tubs. Perfect for families and pets, the Carriage House Apartment has three bedrooms, two baths and a full kitchen. Fruits, homemade breads and biscuits are a prelude to sumptuous hot entrees and Joan's memorable French toast or apple cinnamon pancakes for breakfast in the formal dining room. 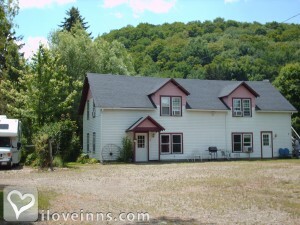 The B&B is near ski resorts, Allegany State Park, St. Bonaventure University, golf courses and a main snowmobile trail. Ask about romance packages and monthly murder mysteries. Payment Types Accepted Include Travelers Checks, Discover, Visa, Master Card and American Express. This property has 6 total guest accommodations with private bath, 2 with fireplaces, 2 with whirlpools, 2 two-bedroom and 1 three-bedroom suites, 1 cottage, 3 guest houses and 1 conference room. The types of beds available include Twin, Queen, King and Double. 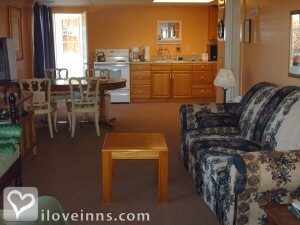 Three completely furnished apartments for short or long-term stays. 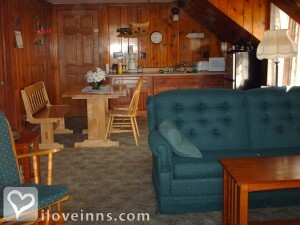 One complete 3-bedroom cottage for short or long-term stays. Corporate rates Sunday to Thursday. Wonderful grotto area. Bird baths and bird feeders. Lots of flowers and shrubs. A stream along the side of the house. 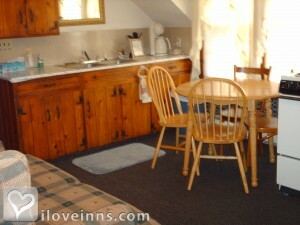 Children allowed in Carriage House suites or Cottage. Two weeks notice with a $50 cancellation fee for any cancellation. Thirty days for holidays. 50% deposit required at reservation. Less than two weeks, the full amount is charged. No last minute refunds because of weather. Built in 1896 for Joseph Gallets, lumberman, oil producer, farmer. One of the finest homes in the area with xix gas fireplaces, oak pocket sliding doors and oak stairway. Orginal furniture and pictures from the turn of the century belonging to Jacob Gallets [great grandfather to innkeeper]. Come solve the crime. Dinner, Mystery, Overnite, Breakfast. Each guest is a suspect. Whodonit?? Gather 6-8 people for a fun event. Great fun for the winter months!!! Get your family and friends together and Call for a Date. $199 per couple. Valid from 01/17/2019 through 12/01/2019. 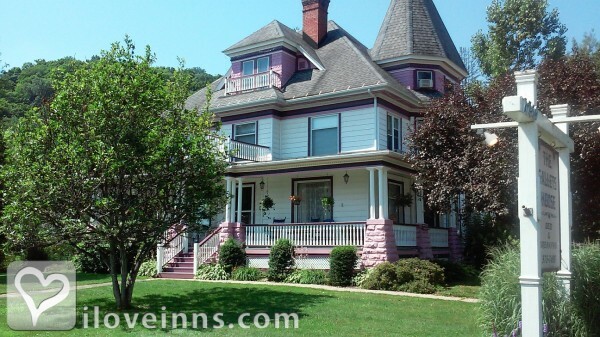 1896 Victorian 4300 sq ft', 3 stories, + basement lounge on 3 1/2 acres, 5 guest rooms and owners quarters , 100' front porch + 3 apartment suites,plus barn and 2 car garage.Also For short term or extended stays.total 6 bedrooms .7 1/2 baths in B&B. Turn key sale.Fully furnished. Valid from 01/01/2019 through 12/01/2019. You worked hard, now it is time to enjoy the week. Stay Sunday to Thurs in a deluxe room from $79 to $99. Includes a full breakfast. Over 25% off regular rate. The rooms have private baths, two have whirlpool tubs, some have fireplaces, all have TV's, DVD, VCR movies available, coffee stations. Valid from 01/01/2019 through 07/01/2019. Relax-Unwind-Getaway- Treat your loved one to a Romantic Getaway, anniversary or birthday gift. 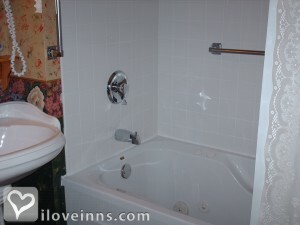 Two night stay in deluxe room with whirlpool bath. Enjoy a lavish breakfast, flowers and candy. Also receive a $50 dinner certificate at local restaurant. Ice bucket and glasses provided. Gift Certificates are available for this special. Great Christmas gift!! Special @ 335.per couple for the two night stay. Valid from 01/15/2019 through 12/04/2019. We were pleasantly surprised when we saw this great house upon our arrival. As this is our first B&B and it won't be our last. You made us fell right at home. The bed was very comfortable and sitting on the porch in the rocking chairs last night was very relaxing. Thanks for making our stay so very enjoyable. Breakfast was so good! We had a great time at the Murder Mystery. This is our first B&BB experience. it certainly will not be our last. Beautiful comfortable home, fine food, very relaxing. Thank You PS- We still think Heavenly Did It! Nice Stay! We never stayed at a B&B before--now we will look for them when we travel. Great House and love the history. Thank You for such a wonderful stay and working so hard for all of us girls. . 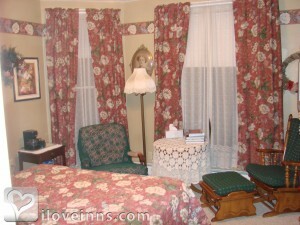 This was a wonderful bed and breakfast! 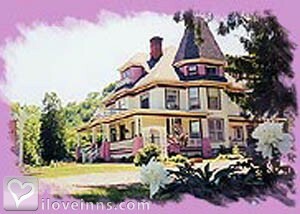 My husband and I had reservations at another bed and breakfast and were very unhappy. We needed a place to stay and Joan was very acomadating! We checked in about 8:00 pm and still got the royal treatment. The place was clean, beautiful and relaxing! Breakfast the next morning was excellent as well. This ia a great place! My wife and I came to Olean/Allegany for my college reunion in June 2010. We were upgraded to a different room with a larger bed because of a cancellation which was very nice. Joan made us feel at home in her house immediately and our room was clean and comfortable. 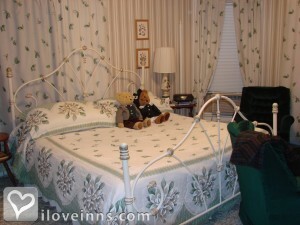 This was our first stay in a B&B and it was a whole different experience that hotels. Breakfast each day was very filling and had a nice home made touch to it. We highly recommend staying here. This is a great place to stay. The Historical Inn is beautiful. The decor of the rooms are tastefully decorated, they take you back in time. Joan and Gary made us feel right at home. We will be coming back here again. Loved the house, the antiques, friendly hostess. Everything was nice. Miriam and I started staying at the Gallets House in 2000. And kept coming back at least two times a year. In 2010 I lost Miriam due to Breast Cancer treatments. But I am still coming back to this Inn a couple of times a year. It's a place where I feel very comfortable and great memories. Joan and Gary are like family. I see regulars quite often now and they feel the same way I do. We just keep going back. John C. Jobe Poquoson, Va.
A lovely weekend night away! We received a gift certificate to go to The Gallets House for our birthdays, and I am so very grateful we did! It was the perfect distance from where we currently live - in Cattaraugus, NY. It was quiet, and quaint, the perfect distance from Allegany and Olean as well. It's in a community I am familiar with because I graduated from St. Bonaventure 10 years ago and then lived in Olean for a year-and-a-half after. My boyfriend and I have 2 children and it was a lovely get away from being the parents of an 8 year old and a 2 year old. We got a wonderful nights rest, a lovely soak in the tub and the owners are friendly and cooked a delicious breakfast. I love the history of the house and I adore Victorian homes. I thank you for your hospitality. We will always remember our night away and I hope you stay open for many, many, many, more years to come. Refresh and Refuel-- Stay two nights Sunday to Thursday get the third night 1/2 off, Plus receive a $25 gas card.